Helena Loureiro was born on December 9th, 1966 in Serra de Santo Antonio, a small village situated near Fatima, in the central zone of Portugal. 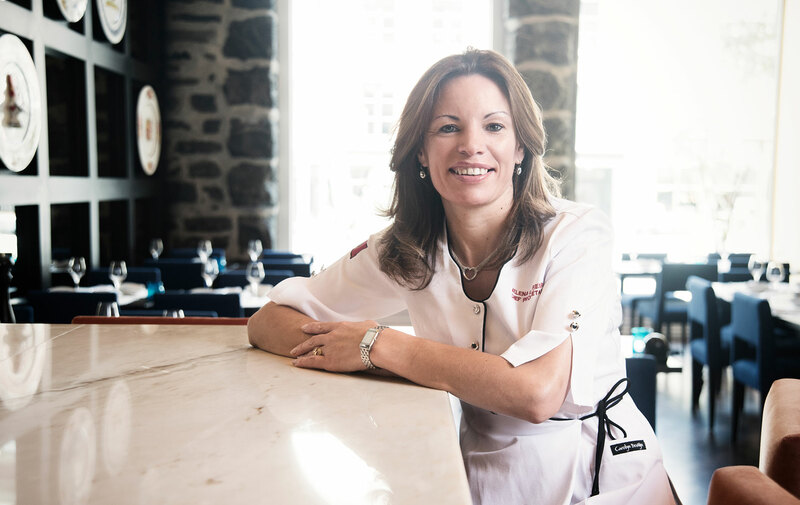 Her passion for culinary arts takes shape early on : from 1983 to 1986 she studies at the Hotel and Catering Institute of Lisbon and then works in various Portugese restaurants. Her desire to travel brings her all the way to Montréal. When she arrives in 1988, Helena completes her training at the Institut de tourisme et d’hôtellerie du Québec, obtaining her diploma in 1990. She then works as Executive Chef at Le Vintage Restaurant, before becoming Chef at Alexis le Trotteur day care center where she works for twelve years. Helena became Chef & Owner of PortusCalle Restaurant, a Portugese fine cuisine restaurant, which she opened on March 7th, 2003. Since then, Helena has been treating her guests to her exquisite dishes, which are equalled only by her warm presence and her passion for her profession. ©2017 Restaurant Helena – All rights reserved.